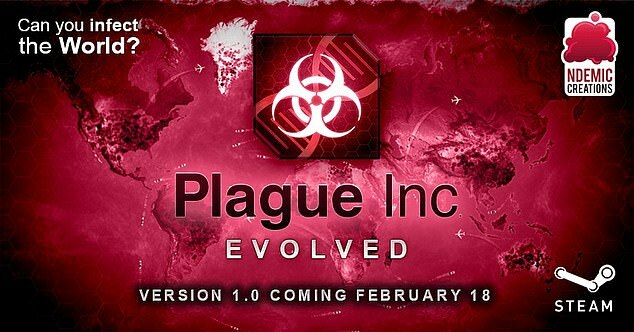 The hugely popular video game Plague Inc. sees players take on the role of deadly pathogens hellbent on destroying the world. But rather than morphing into Black Death or Ebola to wipe out humanity, players will soon be able to rely on a little help from anti-vaxxers. More than 20,000 fans of the game – which was played by over 25million people worldwide in 2012-to-13 alone – campaigned for ‘stupid anti-vaxxers’ to become a ‘fictional’ threat to humanity. 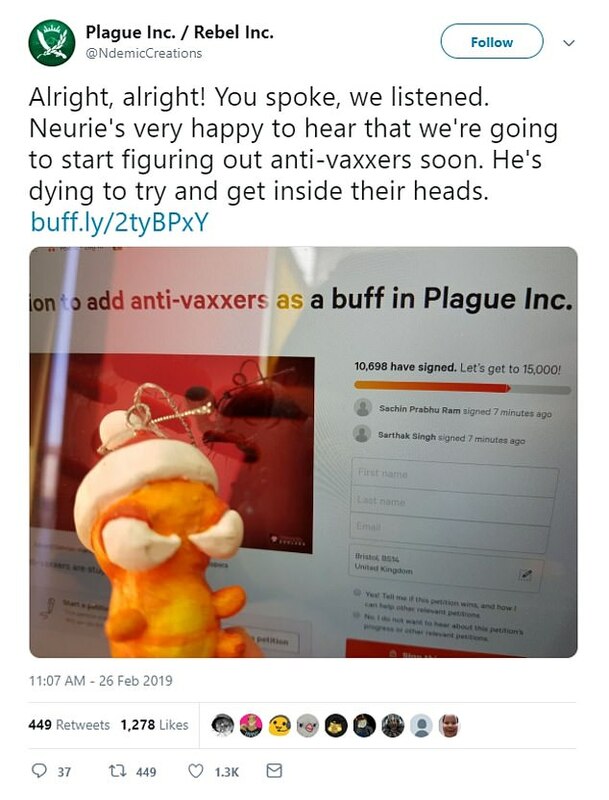 And the brains behind Plague Inc. Tweeted have now announced they will be adding anti-vaxxers ‘very soon’, saying ‘[they’re] dying to try and get inside our heads’. 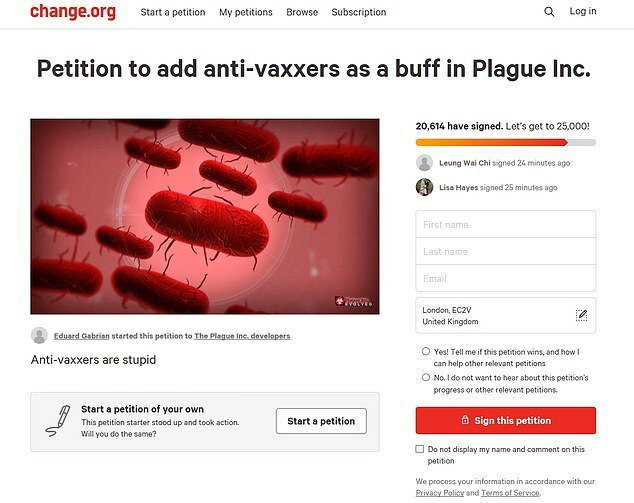 A campaign on change.org aimed for 25,000 signatures to convince Plague Inc. manufacturers to ‘add anti-vaxxers as a buff’. But it took just 20,600 signatures before they announced ‘alright, alright! You spoke, we listened’ in a tweet that has been liked 1,281 times. 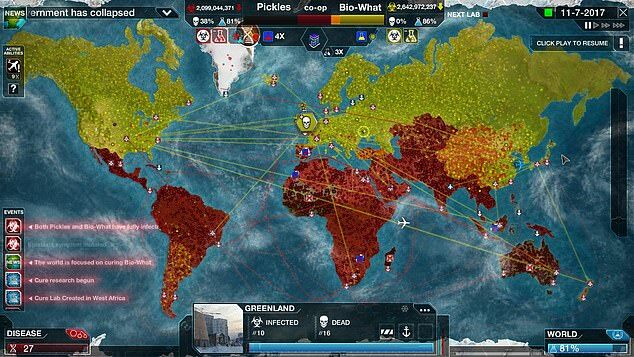 Although it is unclear how anti-vaxxers will destroy Plague’s fictional world, players imagine it will start with unfounded conspiracy theories online – much like it does in real life. This may then lead to vulnerable hot spots, where deadly diseases take hold. Plague Inc. is a ‘unique mix of high strategy and terrifyingly realistic simulation’, according to its website. The game starts with a player – who takes on the role of a pathogen – infecting ‘patient zero’, before aiming to bring about the end of humanity via a deadly pandemic. They must also adapt against humans’ attempts to protect themselves. Economics graduate James Vaughan came up with Plague Inc. to help explore how diseases spread, mutate and survive harsh conditions. Far from just creating light entertainment, Mr Vaughan has given a talk about infectious diseases at the Centers for Disease Control and Prevention. ‘It was more about building a game I wanted to play,’ he told Apple. This is not the first time Plague Inc. has taken inspiration from real-world events. It previously played out a mob of flat-Earthers and climate-change deniers breaking into labs and destroying valuable research, aiding the spread of a deadly pathogen. Vaccination fears soared following a 1995 study by disgraced gastroenterologist Andrew Wakefield that the measles, mumps and rubella (MMR) jab can lead to autism. Health Secretary Matt Hancock is urging anti-vaxxers not to be given any ‘credence’. Speaking at a parliamentary event about vaccinations, Mr Hancock stressed the importance of not promoting psuedoscience that spreads the misinformation of jabs being dangerous, The Telegraph reported. ‘We have to make sure communications around vaccinations are always positive and about the positive value of vaccines, rather than engage in debate which only improves the chances of [false] claims,’ he said.